Prior to his marriage to fellow science-fantasy writer Catherine L. Moore in 1940, Henry Kuttner wrote stories of Lovecraftian horror, weird-menace “shudder” tales, and thrilling adventure stories. But he also wrote blood-n-thunder Space Opera stories in the vein of Edmond Hamilton (one of young Kuttner’s favorite authors) told with a rough-edge style similar to Kuttner’s protege Leigh Brackett. Arthur K. Barnes, an early friend of Kuttner, published his first story “Lord of the Lightning” for Wonder Stories in December 1931. 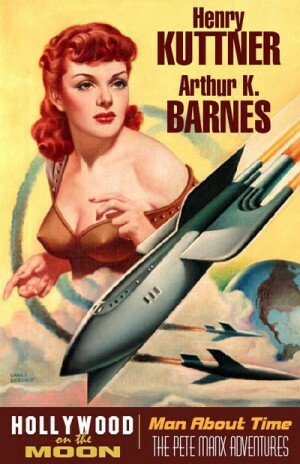 His “Interplanetary Hunter” series featuring Miss Gerry Carlyle of the London Interplanetary Zoo was originally published in Thrilling Wonder Stories. Together, Kuttner & Barnes collaborated (and in some cases, wrote independently) on two series of science fiction adventures for Thrilling Wonder Stories. The first, the “Hollywood on the Moon” series, featured ace cameraman Tony Quade of Nine Planets Films, Inc. and his crew skipping around the solar system (even teaming up with Gerry Carlyle a few times!) humorously encountering all manner of weird alien life. The second series, dealt with the hilarious temporal romps of carnival barker, conman, and small-time crook Pete Manx. Pete is always on the run from some debt collector, or running to his lastest scam for an easy buck. Inevitably, Manx always ends up in the laboratory of Dr. Mayhem, whose unreliable time machine launches Pete into the past where he finds himself in hotter water than before. This volume collects all the SF collaborations of these two punsters and features the interior illustrations of the original magazines.